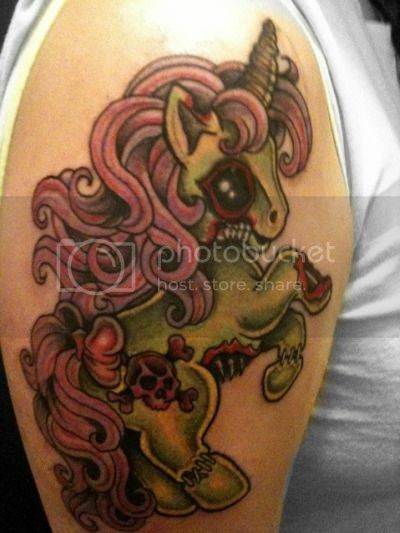 Knowing my fondness for modified My Little Pony dolls, zombies, and demonstrations of hilariously-poor judgment, GWS reader katiedoyle sent me this Zombie My Little Pony tattoo. I wonder what this guy(?) hates more: My Little Pony, or his arm. Via F*** Yeah Tattoos, who loves the f****** s*** out of tattoos. Cute take on my tattoo. I’m actually not a dude, and don’t have too much of a problem with ponies Or my arm, haha it was more of an ode to the f***ed up foster care system.